Well this will be my last post as we are on our way home tomorrow. I have really enjoyed our vacation here and would recommend to anyone for a wedding, honeymoon or just time away. Today we seen about 4 weddings on the beach. They all went out without a hitch and tonight on our way back to our room, there were parties setup on the beach for the reception and we seen quite a few single tables setup for couples to have supper on the beach. It would be a great way to finish off a vacation. There are so many things that I did not have time to write about but it would be a great place to discover. I can tell you that we loved our room,the breach and the food was so great. Every restaurant that we tried we loved. 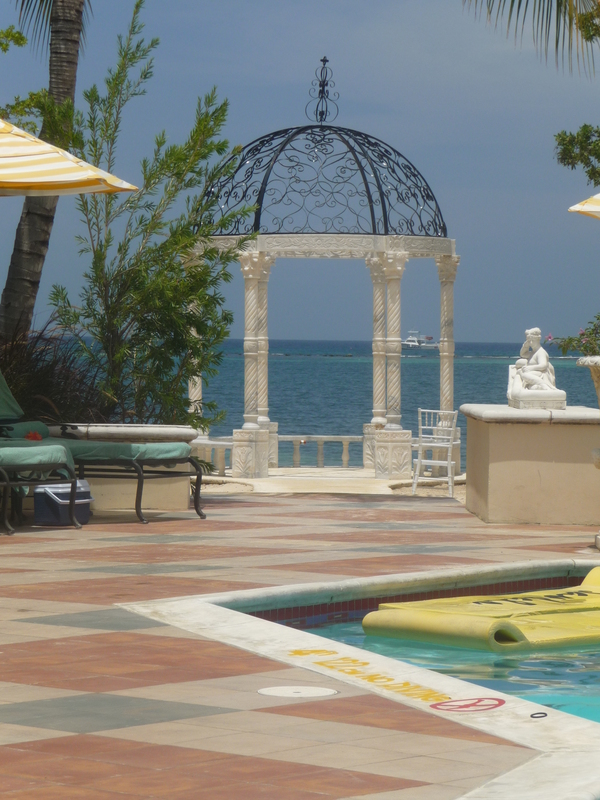 But the best thing about our vacation was the people that we met and the staff here at Sandals. They go out of their way to make sure that you have a great vacation. When they ask me if I am coming back, the answer is YA MAN. After days of sitting in the sun and just relaxing, we decided that today was going to be our activity day. 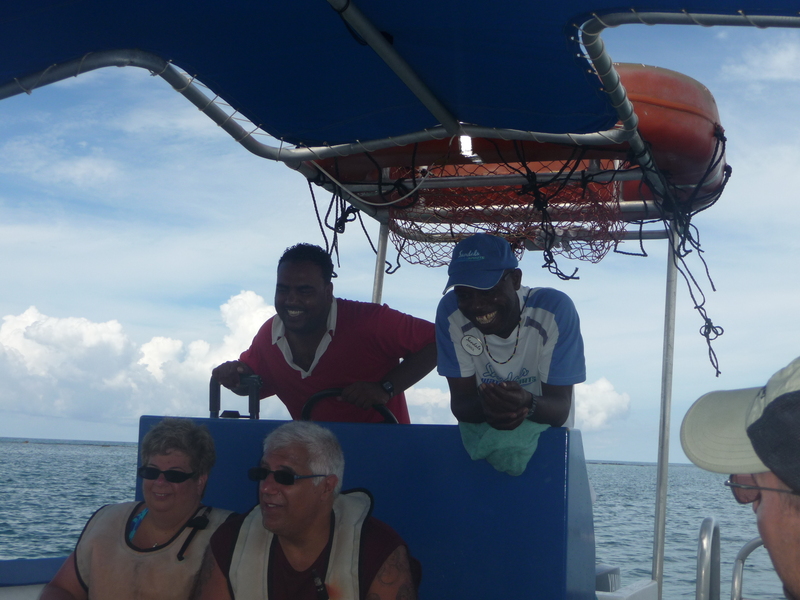 There is a lot to do at Sandals Whitehouse so we started off early at 9:00am with a glass bottom boat ride. We went off to the pier after breakfast and met Alton our boat captain. He explained to us that there is a coral reef just off the beach and that since Sandals is the only hotel on this side, that the reef here was still very good with a lot of fish. 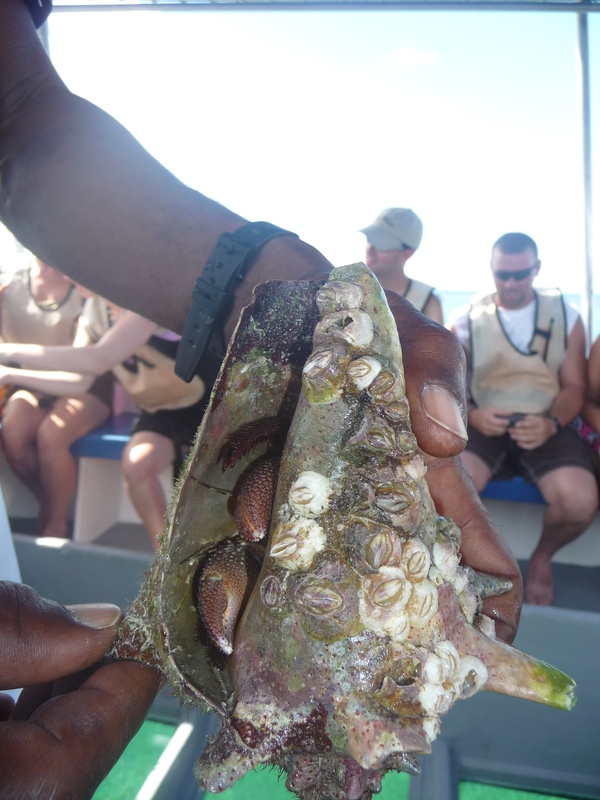 It is your typical glass bottom boat ride until Alton dives off to bring us different things from the reef. He brings in a jelly fish so that we can all see it, then back in to bring up star fish, sea aneome, conch shell and sea slug. While we are passing them around, he explains to us what they are and how they live on the reef. It is really interesting and there is a lot to see on the reef. Not only is he a good captain but he has such a great sense of humor but he knows his stuff and we are back at the boat dock before you know it. Having a look at the reef, we decide that we are going to take the next snorkeling trip at 11:00am. At the sign up desk I ask them about diving and they offer to show us around. At the back, they have a separate pool just for those interesting in learning to dive. They are a 5 star Padi dive shop and have 2 dives a day. One is a deep dive and the other is a shallow dive. All in included in the price here at Sandals. By this time we are ready for our snorkeling trip and get fitted with flippers and head out to the boat. We go back to the reef and have 25 minutes to snorkel. The view is even better than what we could see from the boat. The reef here is fantastic. I see more color here than on most snorkeling trips that I have been on. There is a huge purple fan coral and the fish are all colors and sizes. This is a trip that I would definitely recommend to anyone. When we get back on the boat is seems that I missed some great things but I am really happy with what I have seen. I notice that some people have waterproof cameras. I guess they are in our room and can be purchased for $20.00US. (When I get back to the room I find the basket with everything from the camera to sun tan lotion to a bag. Kind of like a mini bar). Back to the resort and after a quick lunch, we head off to see what other activities we can find. We head out to the beach and on the way pass the games room. Here under the pavilion are 4 pools tables and when we go into the games room, there is a ping-pong table and 2 flat screen TV’s for the gamers. This area is very busy. On to the beach to try out the water sports. Our first choice is the kayaks as we have done this before so no lessons needed. We are told to keep on this side of the reef as the water gets choppier out there. We kayak for about and 1/2 hour and then back in. They have 7 Hobie cats and 3 water bikes. We don’t know how to use the Hobie cats so one of the young guys from the desks takes us out for a quick ride. With just a little wind, you can really get them moving. He tells us that we can come back later today as they give lessons but we decline since it looks like you would need more than 1 lesson. When we get back to the beach, they have taken out the ski boat and are giving skiing lessons. That is a true measure of patience. Fun to watch but yet we move on to see what other activities we can find. At the back of the property we find the gym. They have a full gym with machines and weights. Not to busy in here so we go in. All the equipment is top-notch and the best part of all is the air conditioning. Once outside we slide over to the juice bar to have a quick drink and have a look at the tennis courts. They are also deserted but by now it is probably 33 in the sun so that is not a surprise. They tell us that it is used more at night. Past the tennis courts is the Red Lane Spa. Here they have all the treatments that you could want and it is cool and quite in here. We have a quick look around and then back outside. They are having a Village Fete today at the French Village so we wander down there to see what is up. They have a village setup where you can buy crafts, try coconut water, a BBQ and there is a local painter setup here who is very good. We wander around with our rum and coconut water and look at all the booths. They are also giving quick massages by the ladies from the Red Lane Spa and the Reggae music is playing in full force. We head back to our rooms for a quick shower as we have been invited for an afternoon cruise along the south coast. This is an invitation to all guests staying in concierge rooms. We head back to the pier and get on the diving boat. There are drinks, food and music as we head up the coast. The scenery here is very lush with the mountains as a back ground. As we go up the coast, we find many beautiful homes and are given some of the local flavour. We head up to a cove that is so beautiful and there are local people here fishing. We stop for a quick picture and then head back. We are out for about 1 1/2 hours and it is great to see things from the water. It gives you a good idea of how close we are to the mountains. We are done in for the day so we head to the swim up bar a the main pool. We are always entertained by our main waiter D-Wayne and he is definitely a hit with all the guests. I wouldn’t be surprised to see him show up on UTube doing his bottle juggling. Well that’s it for today. It’s back to our rooms to get ready for supper at Giuseppe’s and then off to bed. Good Night. Got up this morning and it is another great day. The weather is hot with a gentle breeze and sitting on the patio, I can hear the steel drum band playing No Woman No Cry and I know that I am definitely still in Jamaica. 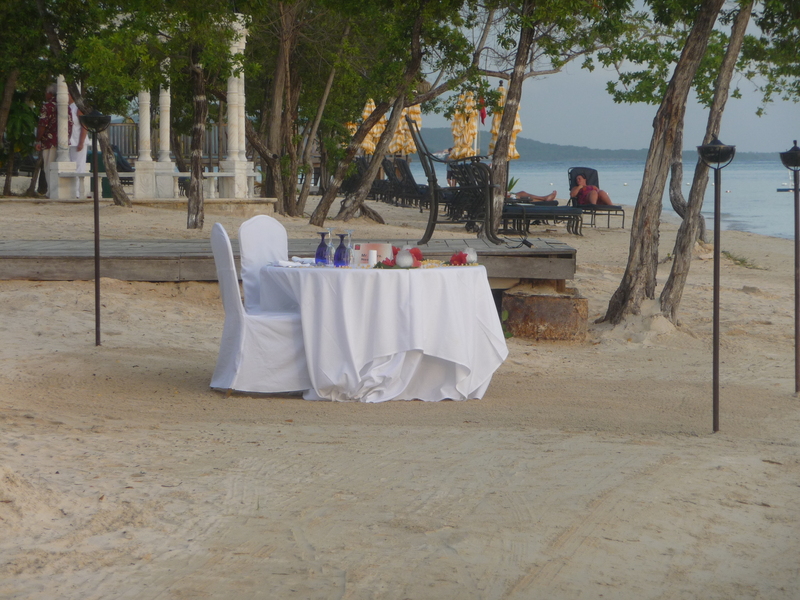 One of the best things about Sandals is the dining. We have been to a lot of resorts but I can say that the dining here is a whole new experience. The day starts out with the breakfast buffet. This buffet is like nothing I have seen at any other resort. We start at one end where they have cereal, milk and yogurt. As we move down, we hit the eggs. They have hard-boiled eggs, then the omelet station where you can get your omelet your way, the fried egg station and the scrambled eggs. They have bacon, ham and sausages. Then down to the potato wedges, fritters and hash browns. From here, if there is still room, you move to the waffle bar. You can get waffles with just a ton of toppings. Turn the corner and you have found bread heaven. All kinds of breads, muffins, pastries, toast, english muffins, bagels and peanut butter. Across from that is the fresh fruit, the sliced meats, tomatoes and cheeses. Then they have left the best station for last. Chef Mark has control of the fresh squeezed orange juice and champagne for a Mimosa and the ever popular chocolate smoothy. Now if you can’t make it to your seat, the waiter will come by and help you. No problem man. 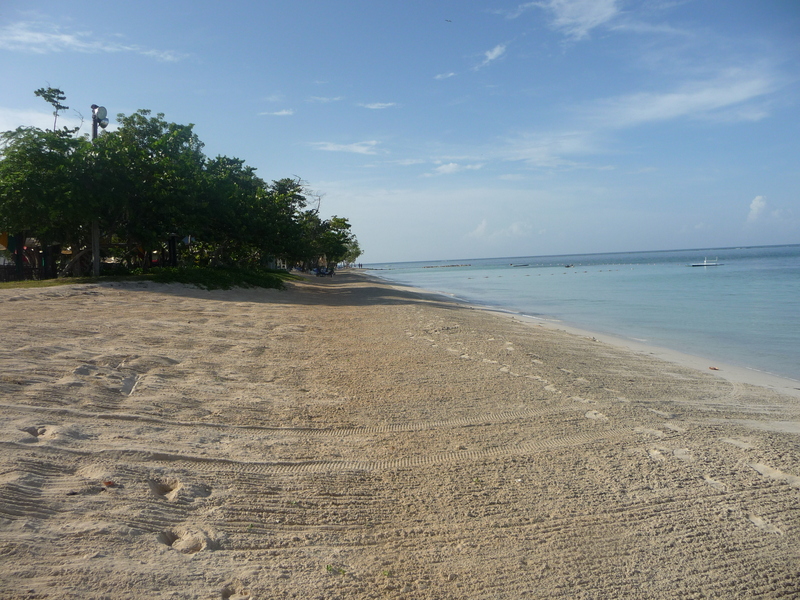 We wait for a couple of hours and then move to Bluefields Beach Club by the French Village. 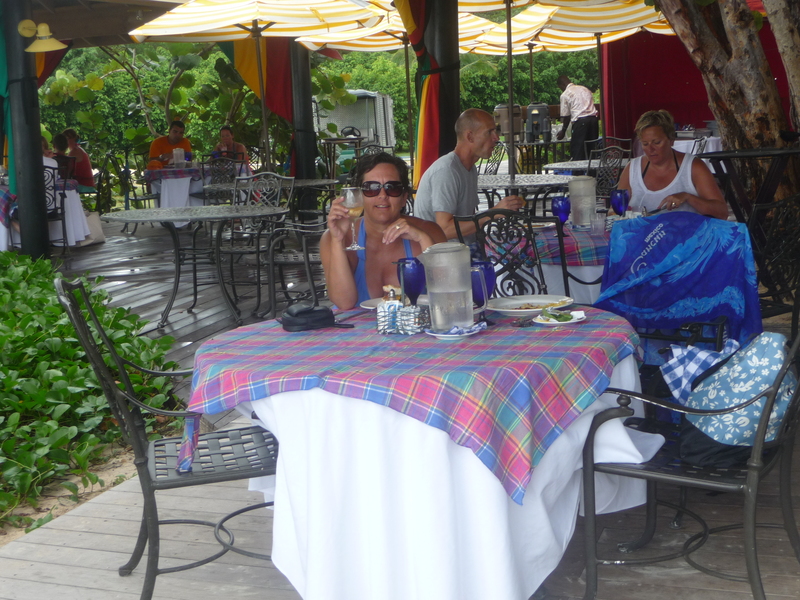 This restaurant sits close to the water but with all the style of your large dining room complete with linen and glass. This restaurant offers Jamaican specialties along with the favorite, burger and fries. It is a great place for lunch. We have decided to decline desert and coffee and go down to the Cafe De Paris where we can get a coffee, and about 20 different desserts. They even make fresh crepes and the ice cream here is very good. Supper here is the best part of the day. Tonight we ate at Neptune’s out by the water under the stars. The food here and service is like a fine restaurant in Saskatoon without the water front. While we eat, there is a violinist playing and the wine is pouring and all is right with the world. From here, we walk down to the central court-yard where they are setting up for the chocolate buffet. It doesn’t start until 9:30pm so we have some time to walk off our supper. When we get back we find a sea of chocolate. They have chocolate dainties, chocolate fountain, chocolate bread and any other chocolate thing you can think of. Some how, we manage to roll our selves back to our rooms to dream about doing it all again tomorrow. Hello from Sandals Whitehouse in Jamaica. The resort here is great and one of the nicer Sandals that we have been to. We arrived in Jamaica on Saturday in Montego Bay and the ride here was 90 minutes. We are used to going to a resort on the north shore so it was really nice to go up and over the mountains to arrive at Whitehouse. It is in the parish of Westmoreland and it pretty secluded. The ride is not as bad as some would make out and nice way to see some of Jamaica. We are staying in the Italian Village but all the villages look good with their own atmosphere. The French Village has the happening and busy pool, the Dutch village has a very quiet pool and the main pool is by us. It is one really big pool like you would find in Las Vegas but the atmosphere here is much better. 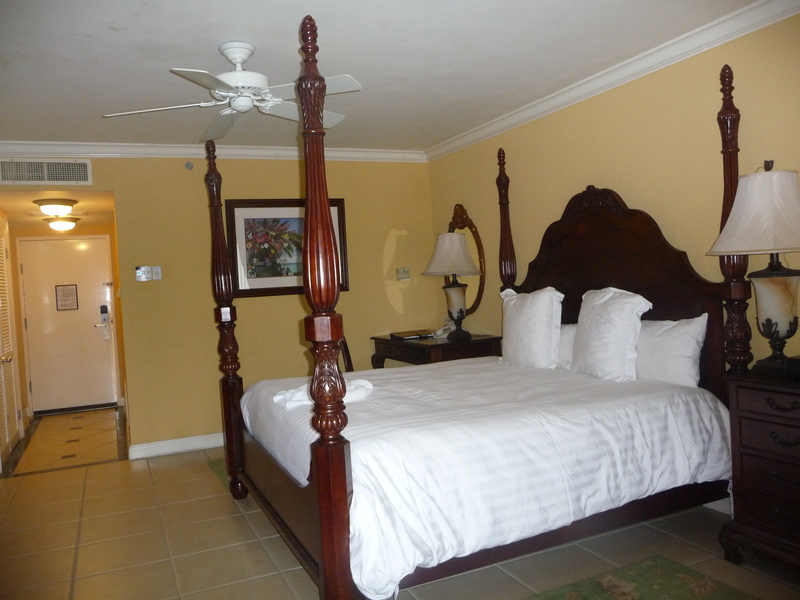 Our room here is fabulous with the 4 poster King Bed, stocked fridge and ocean view. That is the beauty of Whitehouse. ALL rooms have an ocean view. Our room with King Size bed. Very nice. The people here are what bring you back to Jamaica. From the waiters to the hotel staff their great sense of humour and the way they get along with everyone is great to see. The waiters at all the bars are fun to watch and they seem to know every drink and more. The new favourites are the Dirty Banana and the Jamaican Smile. Along with the ever popular Caesar with Clamato juice. What else could you want? We haven’t really done much but sit by the pool. It is great to unwind and listen to the reggae music. We are going out tonight to the Italian restaurant that we hear is so great. But right now we are off to the coffee shop with the great desserts. So much for calorie counting. We’ll talk again tomorrow.